We provide an invitations (known as ‘Visa Letter, Invitation Letter for Visa to Russia – Priglashenie’) for obtaining from Russian Consulates single-entry working visas for teachers. 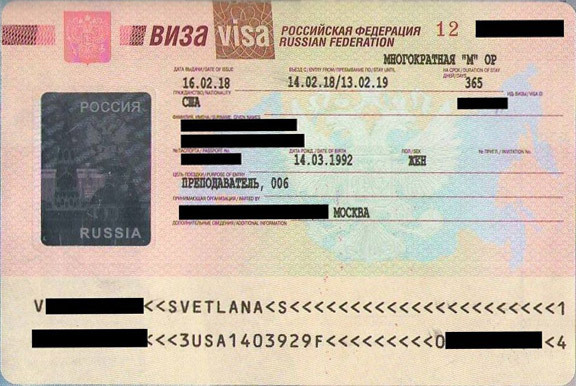 After your arrival in Moscow this visa is converted within 21 calendar days to a one year multi entry. This multi-entries visa allows you to pass the Russian border as many times as you like during the year or to stay in Russia for one year without exit every 90 days. The process of obtaining a Teacher’s Visa takes one month. The Invitation Letter is given by Russian Federal Migration Service (UVM) after 8 calendar days. You just need to provide us the scanned copy of your passport to start the process for the Invitation Letter for your visa. Please note that your passport must be valid for 18 months from the beginning of your entry visa. When the invitation is ready the Original Invitation Letter will be sent to your postal address via TNT or DHL or you can pick it up at our office. After that the invitation will be presented to a Russian Consulate with your Visa Application Form. Usually it takes about 3 working days. Starting from January, 1, 2015 all foreign employees in Russia have to pass a Russian Language and History Test. The foreigners coming to Russia on a Teacher’s Visa do not have this obligation.